In ghost stories, it's rarely smart to blow all the scary ammunition early. Directed by siblings Michael and Peter Spierig (Jigsaw, Predestination), this haunted mansion movie gives us fusillades of fluttery candles, veiled figures, disembodied voices, tolling bells, blind stairways, spooky kids, freaky eyeballs, creaking floorboards, whispered warnings and bleeding walls. Then, with the front-loaded first five minutes up, it finds itself immediately stuck for places to go and launches itself over the top. The whiff of wasted potential weighs heavy, given the Spierigs have true-life material, a dame and decent subtexts to work with. 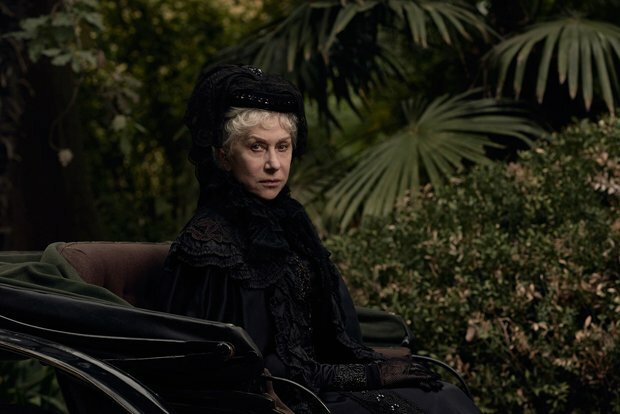 Based on the wife and heiress of rifle magnate William Wirt Winchester, Sarah Winchester (Helen Mirren) is a widow whose San Jose mansion harbours ghosts. The victims of Winchester rifles haunt its halls, forcing Sarah to keep building on the already madly sprawling pile because – apparently – the labyrinthine corridors help distract the dead. In grand ghost story tradition, a sceptical perspective is embodied by psychiatrist Dr Eric Price (Jason Clarke), sent by the Winchester Repeating Arms Company to assess Sarah's mental state. But Price's issues with laudanum and loss create something else: prime conditions to over-excite vengeful spooks. Themes of guns, guilt and grief mount, setting equally perfect conditions for a resonant mystery. Somehow, though, the Spierigs run low on ideas. The scares are largely old-hat, ranging from unexpected manifestations in mirrors to unwanted drafts. Nuance is snuffed out by the predominantly heightened pitch, leaving even a fine cast struggling for air. Price's personal problems give little scope for Clarke to establish an anchoring viewpoint, Sarah's immovability limits an otherwise impeccably poised Mirren's ability to explore psychological grey areas, and poor Sarah Snook (as Winchester's niece) barely gets a look-in. And though a gun-siege set-piece evokes modern horrors, the schlock 'n' load approach allows scant room for scrutiny. When the jump-scares dry up, the Spierigs' decision to demolish half the scenery speaks volumes, as a top-heavy Winchester collapses in on itself. General release from Fri 2 Feb.